We have successfully programmed and deployed all kinds of online surveys, from simple to super-complex, and everything in between. Our highly qualified team employs a huge hosting bandwidth to handle the online survey programming that will help us customize the solution your study needs. By offering survey programming and hosting along with our core sample service, we can be your single resource for online data collection, saving you time, money and headaches. View our EMI Programming Demo to better understand our programming capabilities! 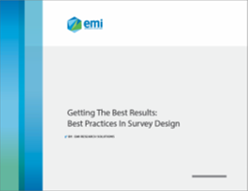 Download our eBook: Getting The Best Results: The Best Practices in Survey Design to get the tips and tricks for a professionally designed survey.